How to Display only Summary in Feed Burner RSS Feed? This article will explain how to display only summary instead of the complete posts of your Feed Burner RSS Feed. If you are a blogger or a website owner, you might have come across the Feed Burner RSS Feed .If you using Feed Burner RSS Feed and want to show only summary in Feed Burner RSS Feed, this blog post is for you. Follow the below steps to change the settings in your Feed Burner RSS Feeds to show only the summary instead of complete blog post. 1. Visit http://feeds.feedburner.com and login with your login credentials and select your Feeds. 2. 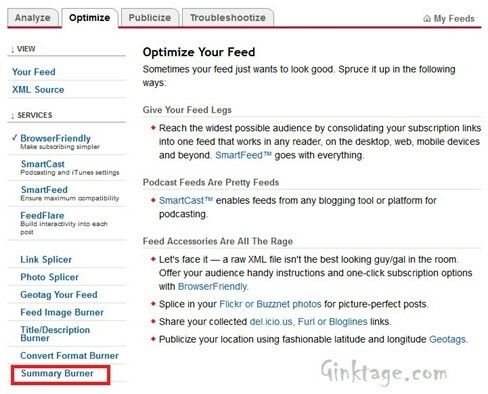 Navigate to the “Optimize” tab and click “Summary Burner”. 3. 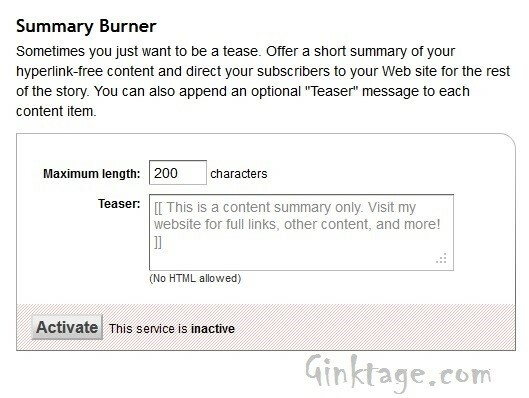 In the Summary Burner screen, specify the Maximum length of excerpts or summary and also provide the Teaser and click “Activate” button. This will activate the Summary Burner feature in your feeds and display only the summary of the specified length.